The	Federation Equestre Internationale (FEI) recently	released the Regional as well as the World Ranking Category Results	for the 2018 FEI World Jumping Challenge and Bermuda’s Equestrians have proven, once again, to be on top of their game! 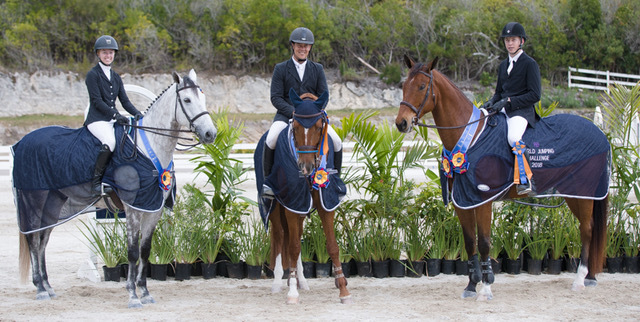 The 2018 Bermuda Team of Philip Correia, Casey Truran and Courtney Bromby secured first place in the FEI’s Regional Team Zone 10 Division. The Bermuda finished 6th in the FEI’s Overall World Team Ranking Category out of 28 competing teams from around	the globe. In the FEI’s Regional Individual Rankings for Zone 10 Division, Correia and his athletic stallion, Emerson, won the 1.20 – 1.30m Regional Category “A” Division – the highest jumping category of the competition. Talented rider	Truran and his	horse De Le Vega won the 1.10 – 1.20m Regional Category “B”	Division, while Bromby riding Worth the Wait finished 2nd in the 1.00 – 1.10m Regional Category “C” Division. Correia riding Hornelli, Kayla Bardgett riding Causing Chaos	& Abby Bardgett riding Up Up and Away finished 3rd through 5th respectively in the 1.00 – 1.10m Regional Category “C” Division. Equally exciting are the extremely solid results that Bermuda’s Equestrians secured in the FEI’s Overall World Rankings Categories. In the Category “A” Correia ranked 19th out of 278 competitors, whilst Truran ranked 24th out of a field of 213 competitors in the Category “B” Division and Bromby would rank 22nd in the Category “C” Division out of 213 competitors. As a result of Correia’s success in winning the top place in the Category “A” Regional Zone 10 Division, Bermuda is eligible to be represented at the 2019 FEI World Jumping Finals, which will be held later this year in	Quito, Ecuador.